Aberdare National Park is one of the less frequented parks, which on the whole can actually be rather pleasant. The main reason is access is allowed only for 4WD’s – the rainy seasons have turned many roads into mud. During the rainy seasons, the park is often closed. The park is located some 120 miles north of Nairobi, in the Rift Valley Region, and is 767 square kilometers big. The Kikuyu, the biggest of the Kenyan tribes, believe the Aberdare mountains are the home of Ngai, their God. The park has a variety in scenery, flora and animals not easily found elsewhere. An eastern hedge of thick rainforest and waterfall hills known as ‘salient’ and the Kinangop plateu, an open tableland of coarse moors that huddles under cold mountain breezes. The Salient slopes are closed by locked fences, which can be opened after getting permission AND the keys from the park warden in Mweiga. Several mountain peaks from the horizon, the highest being 14,000 feet above sea level. The park has several beautiful waterfalls. Paths lead up to platforms from where you can watch the Chania Falls and the Karura Falls. The Gura Falls are even more beautiful, falling over 300 metres (1000 yards), but are less accessible. A 400 km-Long electric fence completely encircles the park. Powered by solar panels, the fence is designed to reduce human-animal conflict by keeping would be poachers and cattle on one side and marauding wildlife on the other. There’s plenty of wildlife present, but as the big rainforest is an excellent hiding space for them, it’s best to stay a few days. Animals present include buffaloes, elephants, leopards, lions, baboons and several sorts of monkeys. Higher up in the moorlands, elands and several cats can also be spotted. Moreover, there are literally hundreds of bird species present, including regal crowned cranes, sparry hawks, eagles, giant kingfishers, sunbirds, plovers, etc. etc. Besides animal spotting, the park allows for some great walking. The high moorlands have three peaks (Satima, Kinangop and Kipipiri) which can be climbed rather easy. However, hikers are required to hire an armed guard to keep of dangerous animals, which costs about KSH 4000 a day (or KSH 2000 for a half day). With so many bird species present, there’s also some great bird watching. Another option is fishing. The rivers in the park carry lots of trout. Aberdare National Park is home to two great tree hotels, The Treetops and The Arks – buildings on piles which make for great wildlife watching at night, as a lot of big animals such as elephants assemble around the buildings. Although both hotels are rather modest, with small wooden rooms, the nightly wildlife watching makes for a great experience. The Treetops Hotel is probably the most famous Kenyan hotel. Princess Elizabeth of Great Britain was there when she was informed that her father the king had died, making her the queen. Contrary to the Treetops, which is located on a plain, the Ark Hotel is in the forest. A salty water pool next to the hotel ensures the presence of plenty of wild animals at night. 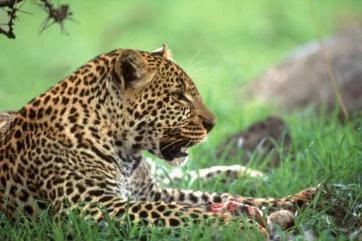 Be aware that buzzers will wake you at night as soon as any of the ‘Big Five’ animals approach the hotel. Even leopards, normally very hard to spot, are seen here occasionally. Prices per night are from about $280 in the low season to $400 in the high season. Other places you can spend the night include, Kiandongoro Fishing Lodge, which costs around $210. It consists of two large stone houses that sleep seven people and each command a food view of moors. Tusk Camp goes for around $120. It is made up of dark cosy alpine cottage located near Ruhuruini gate, and sleeps six people. The entry fee is $60 for adults, $30 for children. Camping is $10 or, for ‘special’ campsites, $15. Vehicles are 200 KSH (about $3).